Show of hands: how many of you guys out there make something new for dinner every single night? Okay. Now, still show of hands: how many of you guys out there have full time day-jobs (like 8 or 9-5:00pm) and STILL make something new for dinner every single night? Well, since we’re not sitting in the same room together, I may as well come clean and tell you guys that my hand’s not up. Although I’m kinda the designated cook in my house- a role I’m admittedly glad to fulfill-I’m still not the type of cook that makes something new for dinner every single night when I get off work. It just doesn’t happen that way. When I look back on past generations where women like my grandma really did make breakfast and dinner from scratch every.single.day, I’m really in awe. I personally can’t see myself cleaning a house,doing laundry, running errands and looking after children all day like she did, THEN on top of that throwing down in the kitchen. I just don’t have the energy for that. By the time I get home during the week, just about the only thing I feel like doing is just warming my food up and sitting down to eat it. Having said that, my personal method of ensuring that me and my family eat good food during the week while also not wearing myself out, is to just make the majority of the food on the weekend, then eat the leftovers during the week. I’m trying to make enough food to feed 4 people for about 5 days, so I also usually end up cooking quite a bit. Roasts, pork loins and jumbo packages of chicken breasts are usually what I look for in the grocery store sale ads- with chicken usually being the one that gets picked the most. It’s the most inexpensive, and I actually kinda prefer it to red meat and pork. Sometimes though, I’ll come across a recipe that calls for red meat that I really really really want to make, and beef will win out for the week- which is basically what happened with this recipe. It’s been a while since I made a beef roast, and when I found this recipe I decided that it would be the one that would break my dry spell. The prep is actually ridiculously simple-you rub the meat over with salt & pepper then sear it in grapeseed oil- and I will say that the grapeseed oil does make all the difference. It has a really delicious, almost sweet flavor that I’ve never had in using any other cooking oil. After the meat is done roasting, then you can really get down to the good stuff: guys, this… sauce. It’s just amazing. It really exceeded my expectations (not an easy task) and was the perfect accompaniment to the tender, juicy meat. I sliced the roast into thick, round slices and poured the sauce on top, then roasted some vegetables with agave to serve on the side. It’s one of the best meals I’ve made, hands down. And even better than that, the leftover sliced beef makes for AMAZING sandwiches throughout the week, hot OR cold. Recipe Adapted from Aaron McCargo, Jr.
1.Preheat oven to 300 degrees F.
2. Add oil to saute pan. Season meat on all sides with salt and pepper. 3. Sear meat on all sides, about 2 to 3 minutes each side. 4. Place meat on sheet tray with a rack. 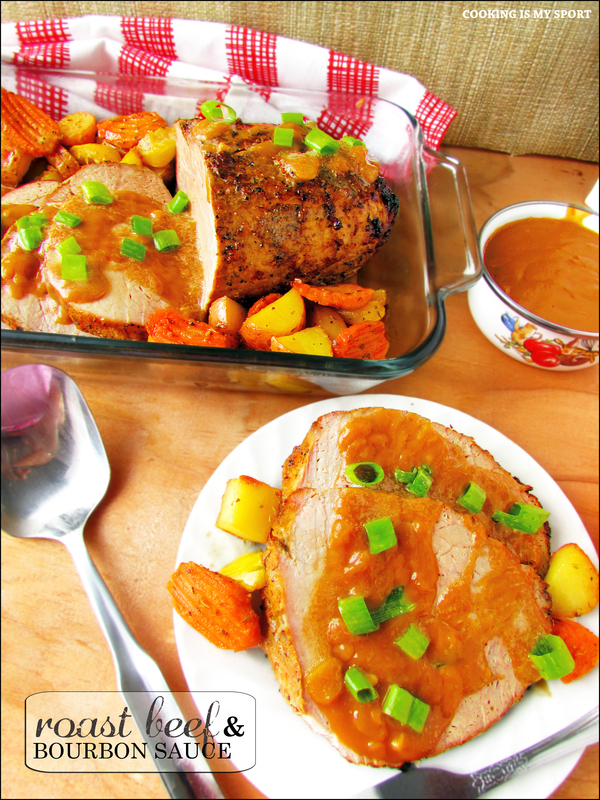 Roast meat for 30 to 40 minutes. 5. Crank oven up to 450 degrees F. and roast for an additional 15 to 20 minutes until crust forms and meat is nicely colored. When done, allow to rest before slicing. In a small bowl reserve juice for Bourbon Sauce. 6. In a large saucepan over medium-high heat, add 4 tablespoons butter. Add garlic, onion and cook for 4 to 5 minutes until nicely Add flour and mix well to form pasty roux. 7. Remove pan from flame. Add bourbon and scrape pan with a wooden spoon. Add stock and mix well removing any lumps. 8. Bring sauce to a boil and allow to simmer for 10 minutes until sauce thickens. Add sugar and pepper. Add 1 tablespoon cold butter and whisk together. Stir in reserved roast beef juice. Finish with parsley. 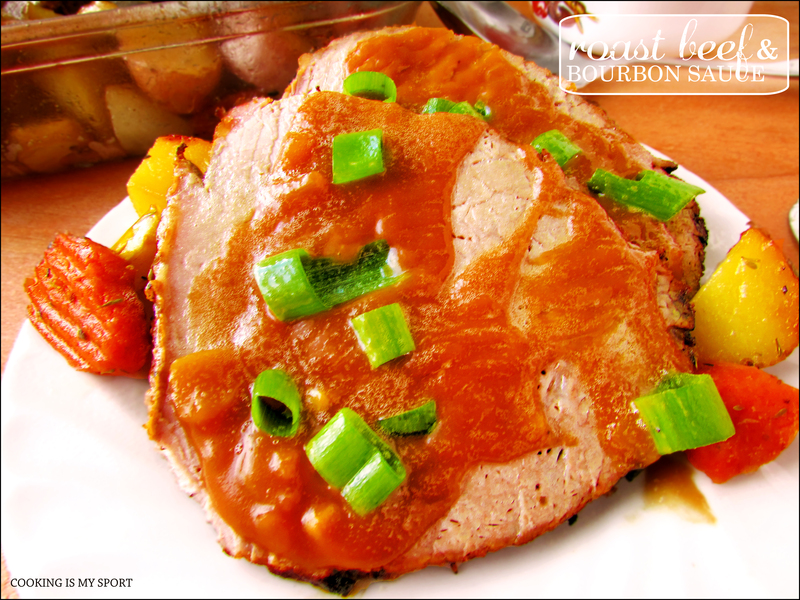 Serve on top or along side of roasted meat. 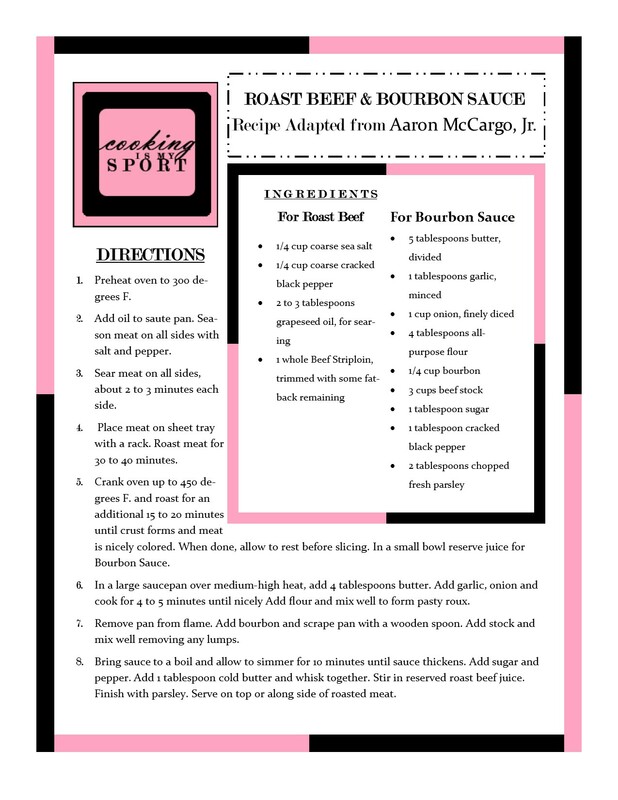 Marinade Recipe I used for Roast Beef. Oh wow, Jess! This looks incredible. I absolutely love roast beef, but have never had much luck the few times I’ve tried making it. Might have to give this recipe a try. And I can’t keep my hand raised to your questions either. I do try to make 1 or 2 new recipes a week, but definitely couldn’t manage it every day, that’s for sure! Thank you Lori, it REALLY was! Nothing better than a beef roast. oooof and those veggies too! Now just need to find some bourbon…. thanks for sharing! I am in the team that doesn’t make something new every night either! I made do with left overs or quick fixes like pasta 🙂 This beef and that sauce looks amazing! This looks so delicious. I also count myself among those who does not cook every day – and I don’t even work. But I also look forward to leftovers and just jazzing them up a bit. Those are sometimes the best meals. Thank you Hilda, so glad to see I’m in good company of people who prefer he make-ahead method. And yes, jazzed up leftovers are the BEST! 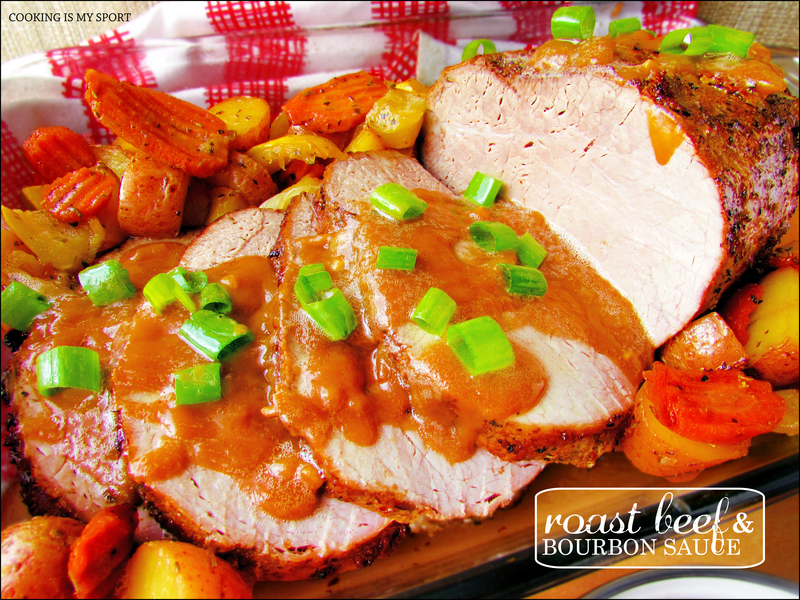 Your roast looks so comforting and good. I cook three evenings a week. We have leftovers twice and go out over the weekend, but it is just John and I now. When the kiddos were home I made sure we sat together at our dinner table every evening even if the fare wasn’t fancy. It’s a great way to find out what is going on in your childs life. I feel bad for the kids that don’t get any down time with their family to just have a meal and talk. Thanks for commenting Jess! This looks so good, Jess! 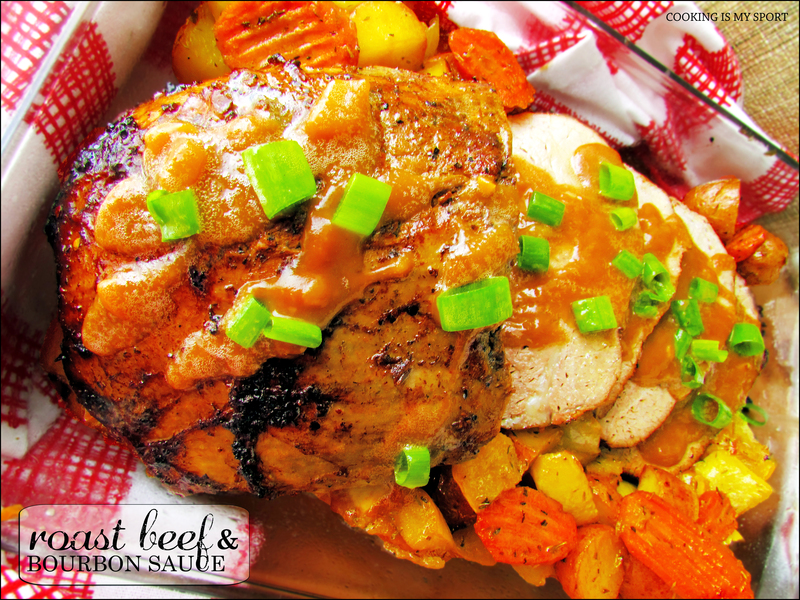 I mostly eat chicken too, but when I make roast beef I’ll have to try this out! Thank you Nancy- you SHOULD, this roast really is delicious! Wow, wow…a perfect cozy dinner for fall! Look so delicious Jess, bravo! I make a bourbon chicken, but have only recently heard about Bourbon roasts! I’ll have to try it next time I need a special occasion dinner. Sometimes I think I’m the queen of boneless chicken breasts – I used them all the time to get the kids fed after work! I haven’t tried the grapeseed oil – it’s usually a bit pricey, but after hearing your comments, I’ll have to check it out! If you can get your hands on the grapeseed oil, I think you should try it out. It has such wonderful flavor.Thank you! Too funny! And yes, I will check out the grapeseed oil! And this recipe. I’ve really been enjoying your blog, too! Was wondering where you were but it’s certainly not too late at all! I do cook everyday but my shortcut is having left over roast meat and a bowl of home made stock in the fridge. That way is it easy to come home, start frying off onions and garlic and veg to be transformed into a stir fry or add tomatoes for a pasta dish or made creamy and spicy to go with rice…the options are endless….I love the sound of sauce for this dish – thank you so much for sharing this with us at Fiesta Friday! Wow!!! 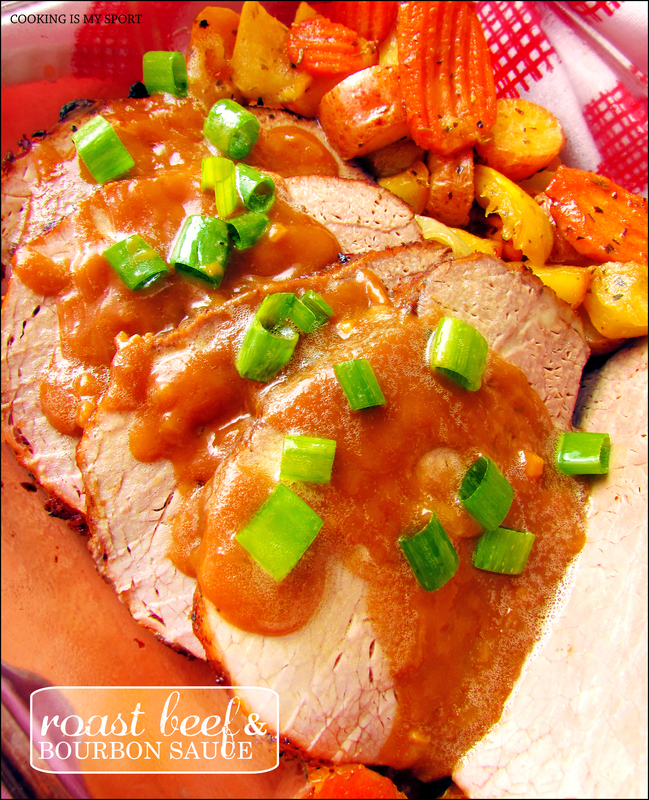 Jess, your roast beef with bourbon sauce looks just gorgeous!!! Beautiful!! This sounds heavenly, Jess! Saving the recipe to make soon. Thank you!